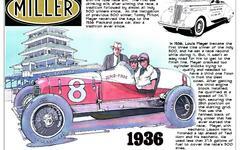 When was the Indianapolis Motor Speedway Conceived? A 1917 National Motor Vehicle Company brochure offers an interesting suggestion that the Indianapolis Motor Speedway was first conceived by its four founders (Carl Fisher, Frank Wheeler, Art Newby and James Allison) in November 1905 at the Indiana State Fairgrounds horse track. The image below appears on the cover of the brochure and depicts the four founders huddled around a bonfire brainstorming as a 24-hour record attempt droned on. The reality is that the concept had probably already been on Carl Fisher's mind for some time prior. If the story is true, it was a critical moment in setting the wheels into motion for the creation of the Indianapolis Motor Speedway. Based on my research I believe the meeting did take place but initially did not believe Wheeler was included as he was the outlier among the four - Fisher had a much more well-established relationship with Newby and Allison dating back to their bicycle racing days of the 1890's. However, I recently came across an article associating Fisher with Wheeler in the spring of 1906 so know I see it as highly plausible that Wheeler was present at that November 1905 meeting with the other founders. The brochure was written and published in 1917 and was the first evidence I came across that the concept of the Speedway came in the fall of 1905. Since then I have uncovered several articles from 1905 and 1906 that connect the dots. Check out the article below titled, "5-Mile Racing Course to Be Built." In that article, Carl Fisher is quoted discussing the specifications for the course and the plot the rejection by the owners of the original proposed site in French Lick, Indiana. The date of this article was December 7, 1905, lending credence to the position that the Speedway concept was discussed at the 24 Hour Record run November 16-17. By February Fisher had apparently compromised on his dream of a 5-mile Speedway as he revealed plans for a giant auto show at the Indiana State Fairgrounds where he proposed a 2-mile Speedway be constructed. His vision at that time was that auto races be conducted on this new speedway to complement the auto show. Evidence of all this is provided in the article below titled, "Indianapolis to Have Auto Show." Just a week earlier the idea of the Indianapolis auto show had been published in the Indianapolis Star with an article titled, "Indianapolis For 1906 Auto Show." By March the auto show was abandoned (see the article titled, "Open Air Show Abandoned") one of the reasons being that no property on the State Fairgrounds was deemed sufficient to support a 2-mile speedway. The search for property to support the grand vision of a great Speedway would require more than two additional years. Just before the Speedway opened in August 1909 the track's Director of Contests Ernie Moross wrote an article for the Indianapolis Star with an interesting premise. He suggested that the Speedway's history began not in 1909 but when Fisher first conceived of the track - in 1905.